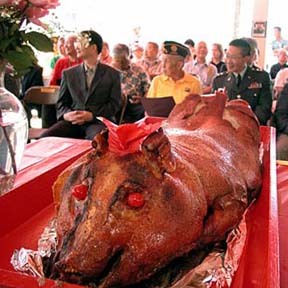 A roasted pig was part of the annual Qing Ming rites at the Chinese Cemetery in Manoa yesterday. Ceremony participants honor their ancestors through offerings of incense and food. The occasion also is a day to clean and decorate the gravesites of ancestors.